Merchandise packs can be used with items sold in your storage shop. Merchandise packs are useful for when you have a group of items that would be discounted if all purchased together. Usually you would discount a group of large boxes with packaging tape. During the below process you will be adding a merchandise pack. 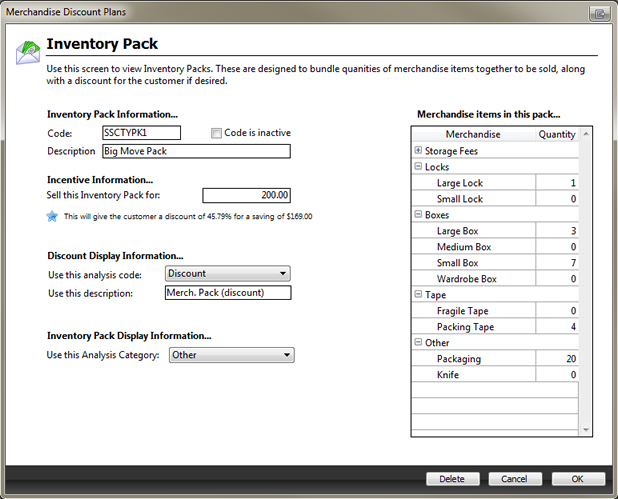 Start the process by navigating through the Maintenance menu to Merchandise Discount Plans. Switch the View to Inventory Packs and select Add Merchandise Plan. The Inventory Pack screen will now appear as shown below. Code. This is the code of the Pack. Description. This is the name of the pack you are creating. Sell this Inventory Pack for. How much you are selling this pack for. Analysis Code. This is the Analysis code assigned to this pack. This code will show in reports as such. Analysis Category. Where this pack is located in the Analysis Code tree. Items in Pack. What items are in the pack. Change the Quantity field to add an item into the pack.